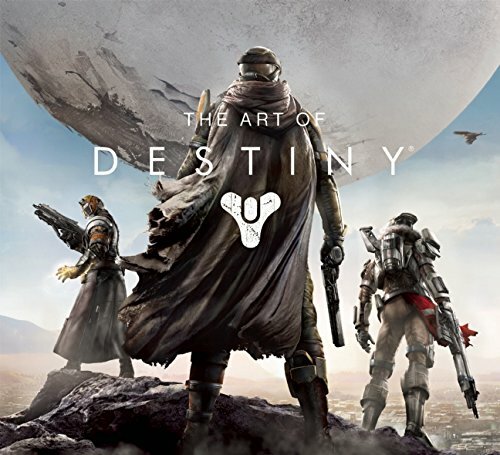 The Art of Destiny is a nice companion art book for the game. It's quite a large 216-page hardcover with a non-glossy smooth surface dust jacket. The paper and printing quality are fantastic. Note that there are two publishers for this book, Insight Editions and Titan Books, selling at different regions and prices. There's a generous amount of sci-fi environment art in the book from the Bungie artists. So if you like the sci-fi environment art from the recent Halo artbooks, you'll enjoy this book. The landscapes from other planets are breathtaking to look at. It's quite cool to see how artists imagine civilization on other planets, in this case collapsed civilization, abandoned cities, space metropolis and other exotic locales. Some of the places do feel grandiose, epic. The environment art are mostly printed gorgeously big but there are also many terrific pieces printed smaller. They are quite detailed and able to hold up to scrutiny even when they are printed across two pages. Other artworks included are designs for the characters, ships, props like the weapons, crests, capes and finally some storyboards. There's a good amount of character designs which includes the costume designs, turnarounds and there are also animation sequences for some attack moves. Spaceships look pretty refined, clean. Finally, there are 14 pages of credits at the back so that just leaves the book with around 200 pages of artworks which is still quite a lot. Overall, the art looks and feels very polished. Recommended for the fans and sci-fi & concept art lovers. Parka Blogs - please tell me what's difference between Insight Editions version with 216 pages or Titan Books with 176 pages? I mean - what's on these 40 extra pages in Insight Editions book? Are those 40 pages with some piece of extra artwork or something else, credits descriptions etc? I'm not sure what's the difference or what Titan Books edition is missing out. Anyway, just get the Insights Editions book.